Shoot a bulls-eye straight to the finish line. "Loved the design and the download was easy. Templates were perfect size. It was one of the nicest looking cars in the derby. We can in 2nd in our den and 4th in the entire pack." The ARROW pinewood derby car design shoots straight to the finish line! 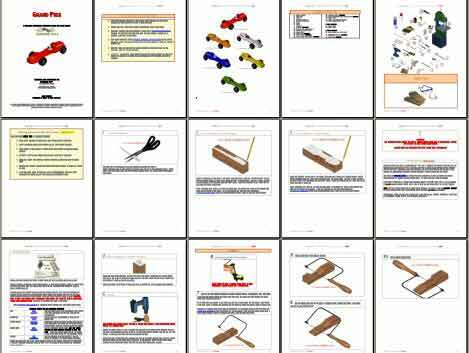 Complete pinewood derby design plan with full instructions, 3D AutoCAD images showing each cut on the car, weight placement, hints, building tips, tool list and car cut-out templates to use as a cutting guide. We even show you your car in 6 different colors, plus give you a 360 degree animation of your Arrow pinewood derby so you can view it from all angles! You can build this car! Our car design plans are the best on the market, guaranteed! We show you how with simple step-by-step clear, 3D images. Download the Arrow Template direct to your computer instantly. Our 3D derby car designs are the best on the market, guaranteed! The plans for the arrow that we downloaded were really great. They included the exact -cut-to-order templates and wonderful ideas and overall suggestions. Great buy! For those of you who have already built a car before, this is a perfect next step. The cuts are easy, and the end result looks really great (the picture does not do it justice). Loved the design and the download was easy. Templates were perfect size. It was one of the nicest looking cars in the derby. We can in 2nd in our den and 4th in the entire pack.